Chivalry is a game which has, in my opinion, made a huge marketing misstep. The trailer advertising the game on Steam is this; a dreary, dull and depressing montage of heavily-armoured men hitting each other in slow motion over and over and over. Not only is this doing the game a disservice by implying that it is boring, but it doesn’t even remotely reflect the overall tone of the game. What the developers should do – if they want to shift any more copies, which they should – is replace it on their Steam page with this, the video that sold the game to me and several other people I know. It’s far more representative of what the game is like: an utterly ridiculous human dismemberment simulator that has turned its low production values into a distinct advantage. 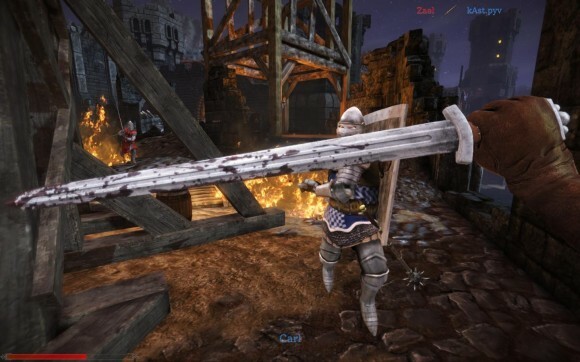 Nothing in Chivalry is taken seriously; you half expect the level backdrops to fall over if pushed slightly too hard, but it’s all played for laughs. Yes, even though it features some of the most horrible FPS deaths this side of Soldier of Fortune, Chivalry is never not funny. It’s bloody and violent in the same way that the Black Knight from Monty Python is bloody and violent, and that goes a long way towards making me like it.